New ways to look at old things as we explore the wonderful world of Vintage! 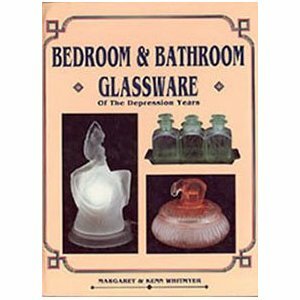 My lifelong love of gorgeous glassware reached its zenith when I discovered a 1990 reference book entitled "Bedroom and Bathroom Glassware of The Depression Years" by Margaret & Ken Whitmyer, and first saw the array of exquisite glass vanity collectibles that are now by far my favorite glass items from times past. The years of The Great Depression in America brought much austerity and hardship, but also gave rise to promotional giveaways and inexpensive items, made from machine produced glass, that were specifically designed to be both eye catching and reusable in a number of ways, and so enticing cash starved buyers to splurge a little. 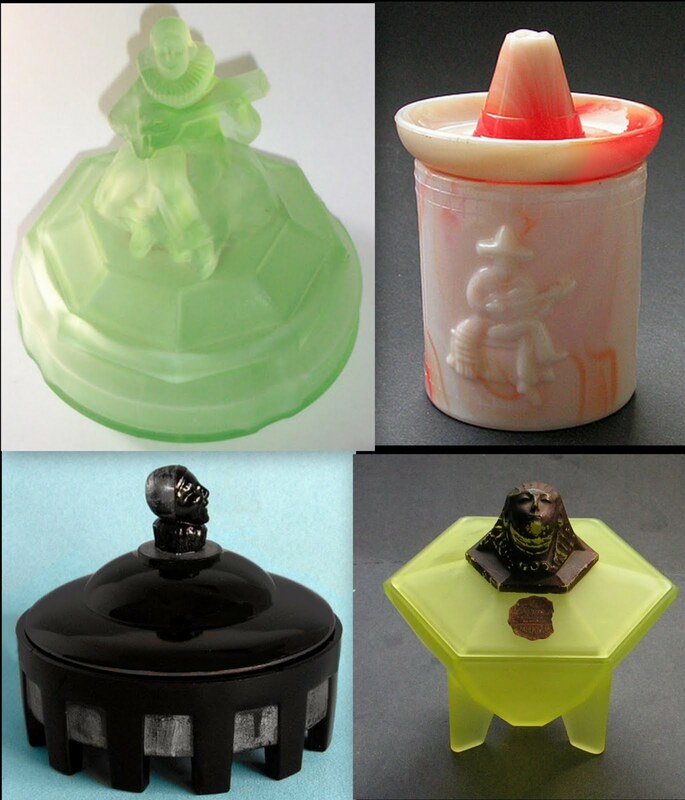 As a result we have the collector’s treasure trove of popular Depression Glassware from the 1920s & 1930s. In addition to the colorful glass (designed to hide the flaws of the low cost production line), the striking designs of the Art Deco era made many of these pieces even more alluring. This is exemplified by the vanity items made during that time, which were usually sold filled with either face or body powder, fragrant bath salts, soaps, cold cream and other lotions, and of course, perfumes & colognes. Once the original products were used, the containers could be refilled with the same products, or used for decorative or other functional purposes. Some of the pieces were also originally sold as souvenirs. 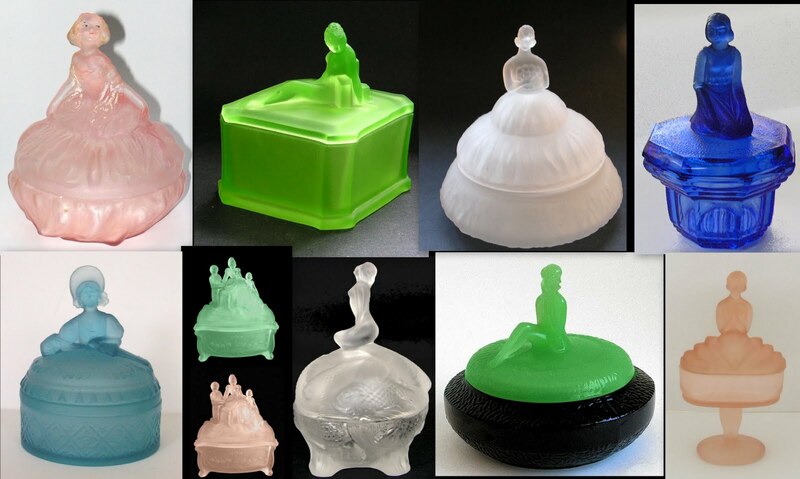 The figural powder jars and puff boxes from that era have come to collector attention, and they are becoming very hard to find, especially in undamaged condition. 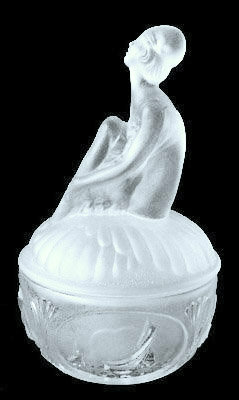 Most of the jars have sculpted figural finials, designed more for artistic appeal than practicality, and this makes lifting and lowering the lid precarious, hence the chipped rims so often found. Occasionally these jars can still be found with their original product label attached, most often Ramses, Dermay or Guimet bath powder and salts. The L.E. 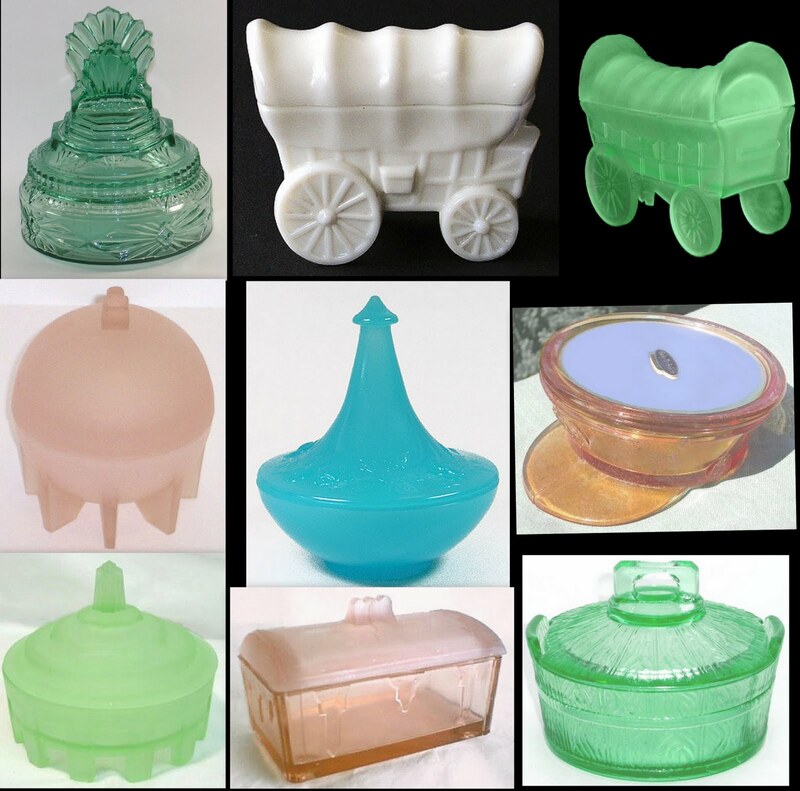 Smith Glass Company was by far the most prolific manufacturer of the Depression Glass figural vanity boxes and jars, often using the same base for different tops, as well as making different sizes and colors of the more popular items. Other American companies known to have made figural powder jars and puff boxes include Tiffin-US Glass, Phoenix, Consolidated, Co-Operative Flint, Akro Agate, New Martinsville, Paden City, Jeannette, and Westmoreland, amongst others, and a number of British and European manufacturers also made them, notably Sowerby in England, August Walther in Germany, and Taussant, Portieux & Vallerystahl in France, plus of course Heinrich Hoffman and other Czech Bohemian glassmakers. 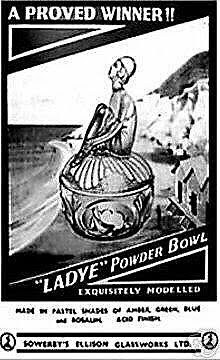 The themes of the figurals on these vanity jars and boxes were as varied as the shapes and sizes, with ladies, especially Art Deco Flappers, being predominant. 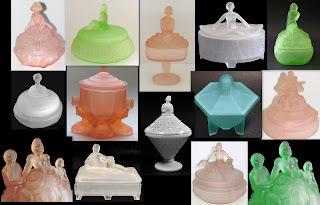 These female forms were beautifully designed, and have been given names by which the jars are now known, like Annette, Jackie, Godiva, Pandora, Claudette etc. A few abstract human figurals were made, including Sphinx, jesters, minstrels, clowns and cherubs. 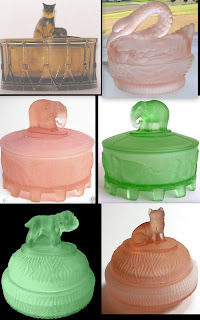 Dogs and birds were also popular, and there are also jars with figural cats, elephants, squirrels and even donkeys, camels and frogs. 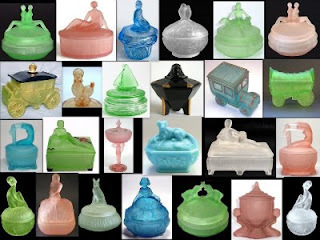 Some of the most intricately designed jars and boxes have the form of coaches, wagons, cars and boats and a few were designed to resemble flowers, hats, buildings etc.